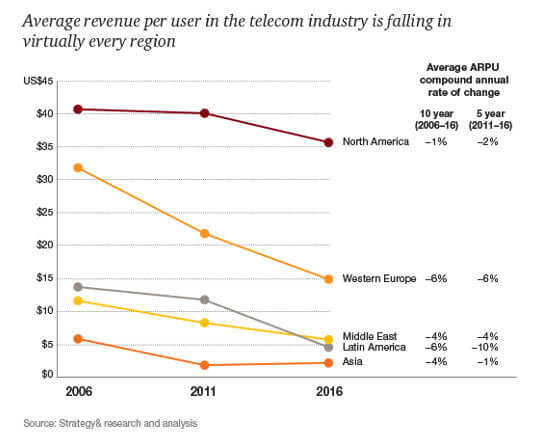 The telecommunications market is in a period of transition—with years of declining traditional revenue, dipping average revenue per user, and loss of growth in the B2C sector, many operators are finding themselves wondering where the emerging business opportunities lie. Are there signs of business opportunities on the horizon for Telcos to step up their business growth in 2017? The consumer market is growing just at 0.6%; in comparison, the B2B market has been growing at 2.6% annually. 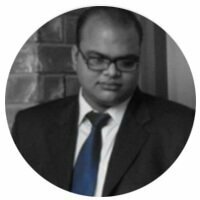 For Telcos, B2B services seem to be the ray of hope to propel their growth in 2017. Just like consumers, businesses have come to expect fine-grained services, unique to their needs. However, while operators have focused their innovations on direct-to-consumer offerings, the needs of enterprise accounts have evolved, and a market opportunity has emerged to cater to these requirements. By re-positioning their offerings, operators can sell more effectively to this growing market, presenting businesses with telecom plans that also encompass workflow management, security, or CRM. By offering these more robust, enterprise-specific plans, operators are assured to distinguish themselves in the B2B growth market. Operators have also seen revenues plateau or drop because of the proliferation of OTT players. Companies like Google, Skype, and Netflix are increasingly taking market share from more traditional telecom providers, making competing with traditional services impossible. 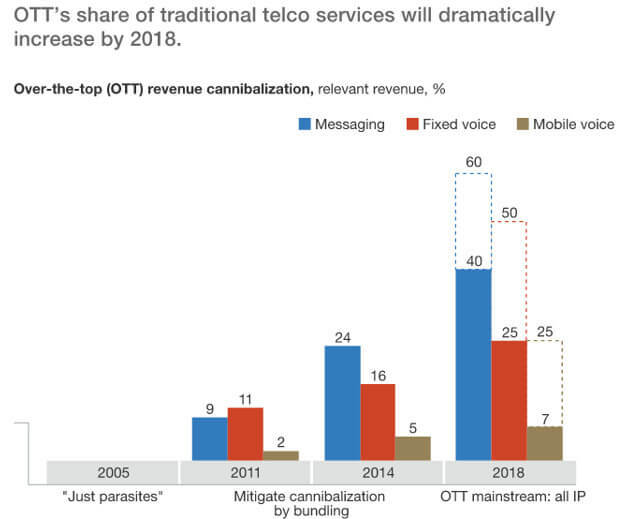 While a select few telecoms have entered the OTT marketplace through large acquisitions of media companies (such as AT&T’s acquisition of DirecTV), this is not a viable strategy for most telecom companies. Instead, the threat of OTT challenges telecoms to differentiate their services according to their unique tech and market advantages. By offering services more easily bundled into traditional telecom offerings, such as cloud storage, enhanced security, workflow management, or CRM, telecoms can find themselves increasing market share without attempting to compete directly with OTT providers. 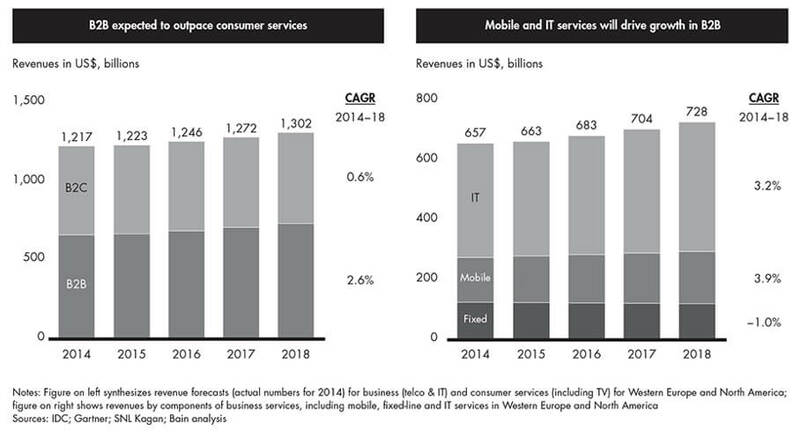 Additionally, by pivoting instead of competing, telecoms still win—after all, OTT use boosts internet and data usage. 5G is the new trend expected to get off the ground in 2017. The potential of 5G to revolutionize business functions is not lost upon industries like transportation and energy. Moreover, 5G is predicted as the key to the rise of M2M and IoT applications like augmented or virtual reality and autonomous vehicles. Cellular-connected IoT devices alone are expected to create 1.2 billion lines by the year 2020, the equivalent of 15% of global mobile subscriptions! The rise of 5G will enable such data-hungry technologies to thrive, creating a whole new market segment for telecoms. Exploiting the potentials of new technologies could well be the new line of attack for the telecom companies. Vehicle connectivity, for instance, proves this point. In the US from January to March of 2016, connected cars were accountable for 32% of mobile connection net-adds, outpacing tablets (23%) and phones (31%). While telcos set their eyes on exploring new revenue-earning opportunities, collaborations established with these emerging technology players will prove to be viable to make this happen. Facts aren’t enough, a brand needs to tell stories. Stories that people want to read, share and read again. Stories that deliver on business goals. I am the guy who turns facts into stories.